Perfect for playing games, piecing together puzzles & more! This is for one Brand New Multi Color Kids Toy Storage Bin Box Table and Two Benches Furniture Set. 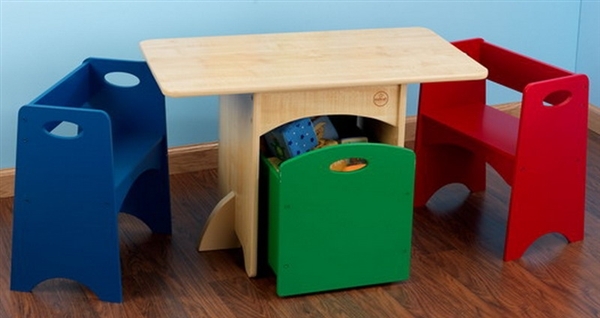 This Natural Table with Red and Blue Benches and roll-out Storage Bin gives kids a fun workspace that also provides convenient storage. Green storage bin has casters for easy access, and it fits neatly under the table along with the benchens for a tidy look when not in use. This adorable room accessory would make a great gift for any occasion. The fun colors fit any decor. Assembled size is Table: 32"L x 18"W x 20"H Bench: 16.13"L x 11"W x 18.38"H. Assembly Required. New Big Disney Cars Inflatable Kids Bounce House Jumper Bouncer 14'-4" x 13-4"